Stone Age Wrist Bands.Includes: One Pair of Wrist Cuffs.Available Size: One Size Fits Most Adults. *Costume and Other Accessories Sold Separately.Jungle fever! 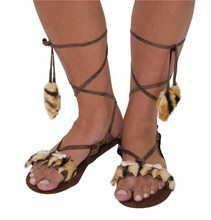 Every Caveman or cave woman needs a great pair of fur and tooth wrist cuffs and ours are the perfect accessory for your cave or jungle costume! 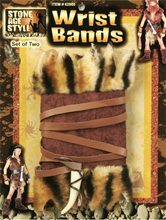 These Stone Age Wrist Cuffs are a great addition to any adult caveman costume! Includes two adjustable wrist cuffs. One Size Fits Most Adults. Stone Age Earrings.Includes: One Pair of Stone Age Earrings. Available Size: One Size Fits Most Adults and Teens. *Costume Not Included. Accessories Sold Separately. Most women love jewelry and a cavewoman is no different. 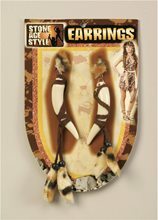 Our Stone Age Style Earrings are the perfect accessory to complete the look of your cavewomancostume. Stone Age Necklace.Includes: One Stone Age Necklace. Available Size: One Size Fits Most Adults and Teens. *Costume Not Included. Accessories Sold Separately. Take a bite out of the competition with this Stone Age style Skull & Teeth Necklace and complete your caveman or medicine man costume in Grand Poohbah style. Includes tooth and skull necklace as shown. 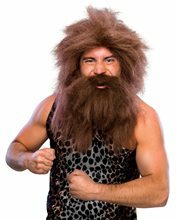 A great accessory for any caveman or cavewoman costume! Stone Age Style Choker.Includes: One Stone Age Style Choker. Available Size: One Size Fits Most Adults and Teens. *Costume Not Included. Accessories Sold Separately. 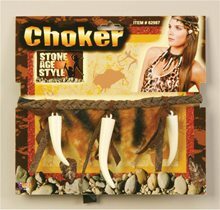 Stone Age Style Choker: Most women love jewelry and a cavewoman is no different. Our Stone Age Style Choker is the perfect accessory to complete the look of your cavewoman costume.. 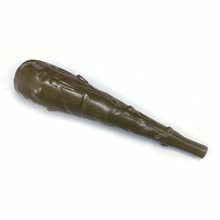 This item part of Accessories & Makeup, Caveman costumes. Stone Age Style Tooth Bracelet.Includes: One Stone Age Style Tooth Bracelet. Available Size: One Size Fits Most Adults and Teens. *Costume and Accessories Not Included. Sold Separately. Most women love jewelry and a cavewoman is no different. Our Stone Age Style Bracelet is the perfectaccessory to complete the look of your cavewoman costume. 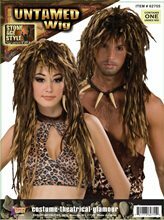 Complete your Stone Age Costume! 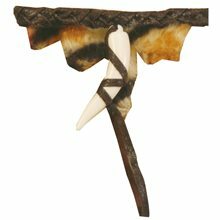 Your Cave Woman costume wouldn't be complete without some prehistoric accessories. Finish off your look with the Women's Tooth Bracelet. 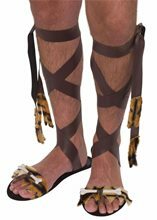 In true Stone Age fashion, the accessory includes a braided bracelet with a fake tooth and faux leather straps hanging down.